WTF… What municipal law enforcement agency needs this?? This is a new age; one where image means everything, news travels at the speed of sending texts, and a once-peaceful crowd can turn into a seething mob for the least little perceived provocation or infraction of authoritarian control. Most importantly, everyone has to play for the camera… er, cameraS, and everyone has a camera.. the media and the demonstrators, and the world is the audience to pass judgement. Piss off the viewing audience enough and they complain to their political leaders and make demands, and then before you know it, the President has to weigh in, bowing to political pressure and opinion polls. Then the lawmakers step in because everyone thinks “there outta be a law!”. A publicity nightmare for everyone, from the cause being presented by the demonstrators right up to the President of the United States. In the end this big knee-jerk only hurts the public. As you might expect I have some modest thoughts. Great use of color makes this group still look authoritative but not the least like storm troopers. * Police riot control image – Many urban municipalities dress their cops up in that nice black SWAT-looking gear. Well, the problem with that is when you are confronting demonstrators in a regimented line it looks like any number of Hollywood movies of some variant of Big Brother fascist storm trooper oppression. Covering the face (under the helmet) so as not to be facially recognized is a contemporary image of a Mid East Al Quada or ISIS terrorist. I mean, c’mon… the demonstrators are going to want to fight back… or in the least be more resistant. Here’s another odd thing.. there’s a pic showing the Ferguson police at night trying to disperse a crowd with the usual tear gas. What are they wearing? Desert camouflage uniforms. Desert camo in Ferguson, MO?! At least the black BDU’s made some sense color-wise, for nighttime urban cover and concealment operations. Did the Ferguson PD get a Pentagon uniform freebie leftover from Desert Storm or something? Here’s my suggestion. For riot control purposes have the police wear some color that does NOT encourage a military assault image or storm troopers. Cover and concealment means little in riot control. Take an example from the United Nations soldiers. Those guys wear blue helmets.. and their armored vehicles are painted all white. It keeps them non-threatening to all sides in a given conflict and easily recognizable on the battlefield. These guys don’t look like storm troopers in the least. * Do you really need tanks or those MRAP armored vehicles? 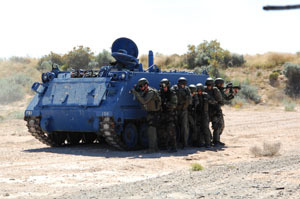 MRAP means, Mine-Resistant Ambush Protected. 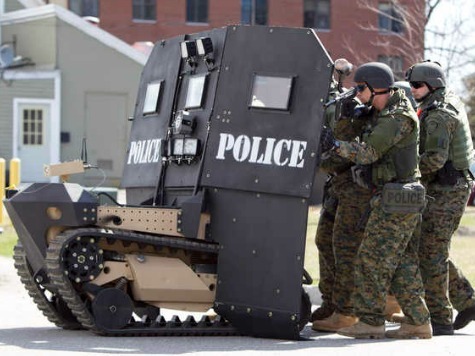 The question is… are the threats to police in urban areas or small towns (yes, MRAP vehicles have ended up in small communities) consistent with land mines and fear of armor-piercing ambush? Just WHO or what is the threat to police that requires these behemoths? They gotta be expensive to operate and repair. But besides that, these things, just sitting there, look like they were intended for use in the apocalypse. The only thing these things are going to do on a city street is look like an invading army. Seems to me all any urban police department might need is maybe one of those smaller armored personnel carriers with the battering ram for knocking down doors and busting holes in buildings in support of regular SWAT operations. Other than that, why not just get a few regular armored trucks of the kind used by Brinks. Outfit them with the little perks for riot control. 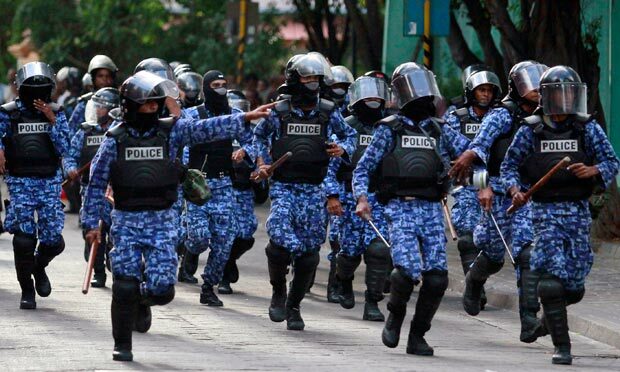 Those don’t look militarily intimidating in a police line.. and they are bullet-proof all around. Yes, they aren’t going to take a direct hit from a terrorist RPG (rocket propelled grenade)… but there’s not many RPG’s in America where that threat has any merit. 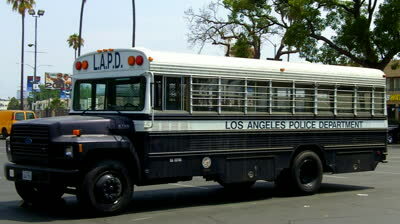 All you need to arrest rioters. * Less threats and more arrests – Ok, I don’t pretend to know more than the police nor do I have a law degree to understand all the things police departments can and can not do in riot control, but here’s a thought from a layman. Forget the tear gas, rubber bullets, and flash-bang grenades. Have a truck with public address loudspeakers inform the demonstrators that they have now passed the line of being peaceful and they are violating public safety and destroying property. They have five minutes to disperse or be arrested. After the five minutes have passed you begin marching the police lines forward, followed by buses or similar vehicles, and when they come across a demonstrator who has defied the police order to disperse you grab him (or her), pass them to the back of the line where they are promptly placed in a vehicle and subsequently to a confinement facility for arrest processing. Forget all the “dispersing the crowd” tactical weaponry garbage. Make the announcement to disperse only once then start arresting. Obviously an urban police department would have made some advance precautionary preparedness plans on a location for holding large numbers of people for arrest processing in the event of civil disobedience situations. Now, to the credit of certain police departments, some have tried to return some of this unnecessary and ridiculous military equipment back to the Pentagon, and that has spawned a bureaucratic mess of sort. The military has little or no procedure in place for accepting returns. Here is a quote from an article published on the Mother Jones website. In the past eight years, the Pentagon program has loaned local law enforcement some 200,000 ammunition magazines, 94,000 machine guns, and thousands of armored vehicles, rifles, aircraft, land mine detectors, silencers, and grenade launchers—all at the request of the local agencies themselves. But images of the unrest in Ferguson, Missouri, of police in military gear cracking down on peaceful protesters, have turned many communities against a program critics say has eroded the line between police officers and soldiers. 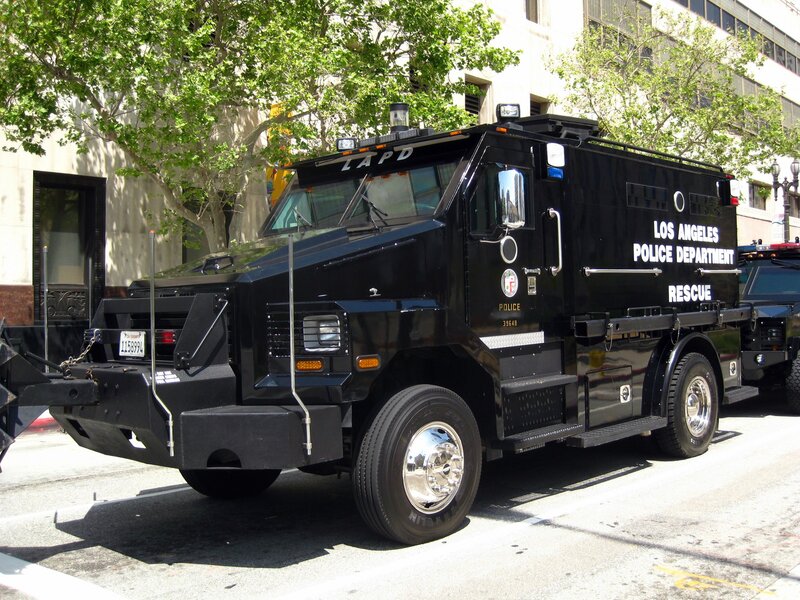 Recently, in response to the local outcry over aggressive policing tactics, San Jose, California’s police department announced plans to return its mine-resistant, ambush-protected vehicle (MRAP), and the Los Angeles school system police department has agreed to return its three grenade launchers. (Ref: http://www.motherjones.com/politics/2014/09/police-departments-struggle-return-pentagon-military-surplus-gear ). Yes, there has been some progress in the last 40 years, since the Days of Rage of the 60’s in handling civil disobedience. Remember the old photos and film footage of the black civil rights marches in the South when the police used to rush into the crowd and start beating away everywhere and using water cannon? Or how about the 1968 Democratic National Convention when the Chicago Police, only in helmets… no fancy riot gear… just ran into the crowds of “hippie” protesters and started clubbing away. I think as a nation we’ve gotten over that riot control nonsense. But we have a way to go. It seems we need to change riot control strategy from crowd dispersing to making arrests for civil disobedience and not listening to police lawful orders. 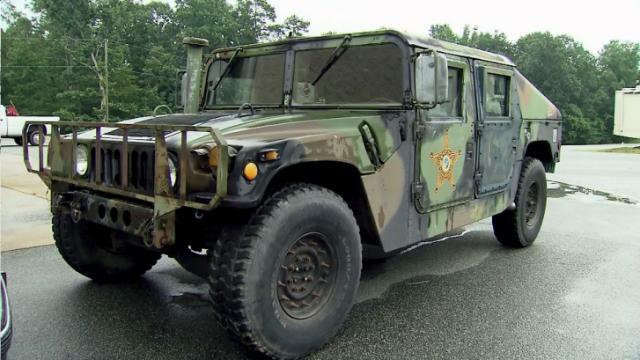 This military HumVee could be very valuable to some police departments in rural areas. 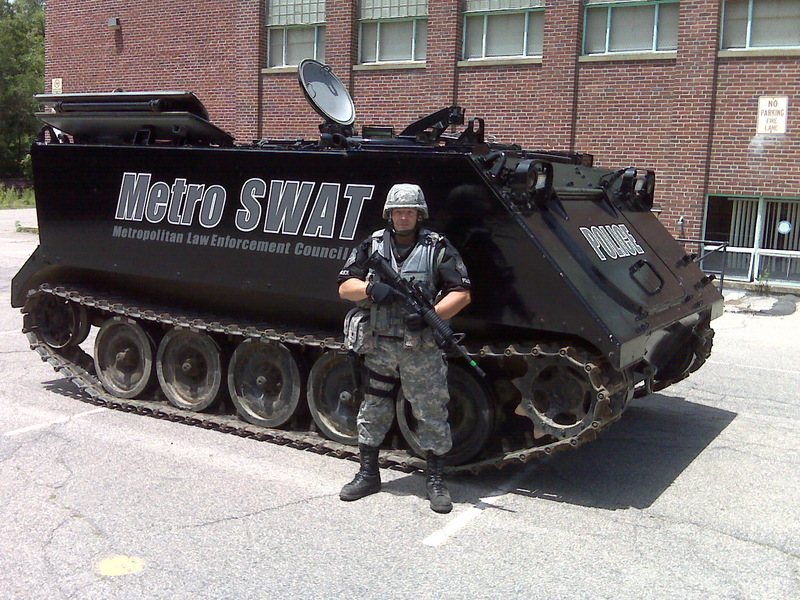 So what can urban police departments use if not all the military hardware they can get is free from the government? Well, see, that’s the checks & balances provided by sticking to budgets and having to justify purchases with public tax dollars as compared to the freebies from Uncle Sam just because he’s giving stuff away. Yeah, no question it’s cool stuff, to be sure. But is it really necessary to do the job or does it amount to overkill? Sure, it saves public expense for having to purchase these vehicles and weapons but the public has no say so if they want their police department to have them. And when you are using all this cool military stuff for the public good does the image it portrays to the public… for the public good? Don’t get me wrong here. Some military vehicles may find a purpose in law enforcement. A military Humvee may have a real practical use for law enforcement in rural counties that have large expanses of open land to cover, but does such a vehicle make sense in Chicago or New York City? The things are not generally armored-up when given to law enforcement as they might have been in Afghanistan. Let’s look at the tracked armored personnel carrier (see pic below). Does Bellingham, Mass. (only 16,000 people??) really need one of these things? The only application I can think of for this vehicle is maybe for traversing snow, but… the tracks are not wide enough in some snow areas, like Alaska. Again, maybe the large counties and states with varied terrains. For urban use? You tell me. This thing is part of Bellingham, Mass. law enforcement. Why??? Police should present their proposals to the city council because it’s all about ‘WE, THE PEOPLE’. 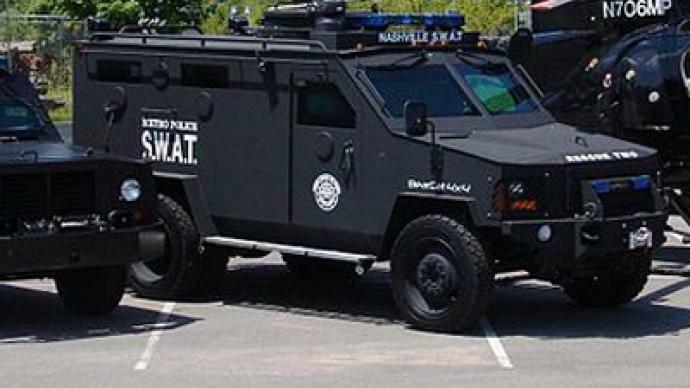 If any police department elects to not use military equipment provided by the Pentagon there are, in fact, companies out there who do sell law enforcement versions of many vehicles that have armor sufficient for civilian law enforcement operations. These things (note some of the pics below) have a military feel to them but are nothing like their large and imposing military cousins bristling with gun turrets, gun ports, tank treads, and sometimes a cannon poking out. But these items are expensive. Procedure calls for someone in the cop shop preparing a proposal for the money to purchase the item. 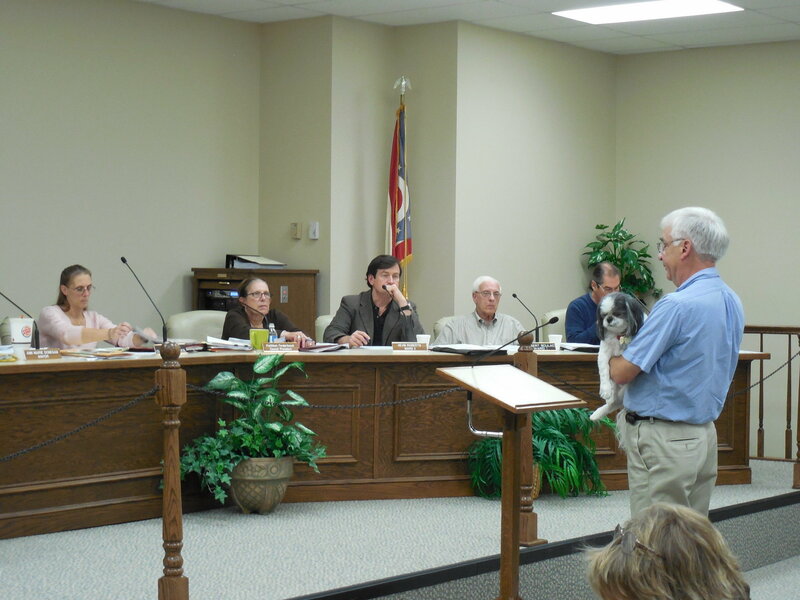 Then that proposal goes to the local city council for debate (or in the case of county, the county board; state police have to go to the state legislature). If it makes sense and the expense is justified and a vote passes, the police get what they want. This is the way it should be. In fact, if there isn’t already such a law, I would think that any donation to any police department must have approval for acceptance from the local governing body and not just the local police commissioner. If the Pentagon gives a tracked armored personnel carrier to the local police then approval should go before the city council not only to accept the vehicle based on a need justification but also to make sure there are funds allocated for training on how to drive that thing… and for ongoing maintenance and putting fuel in that gas hog. If there is no money for training and the extras then the vehicle cannot be accepted. That’s how it should work. It makes the police responsive to the community. This design is not military but works very well for law enforcement. Here’s another of those APC’s. Looks more practical on the Normandy beachead than in an urban area. But.. the color is great for toning down the intimidating image. Another law enforcement vehicle design. But why paint it army green? Why are the officers wearing forest camo in an urban setting… with black law enforcement tactical gear? Are they supposed to be blending in with something? Another example of a law enforcement design vehicle, although the paint job could be modified to be less intimidating. 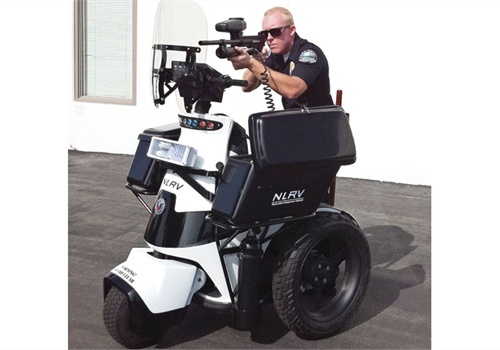 Um… one of these to allow a cop to get around easier makes sense. 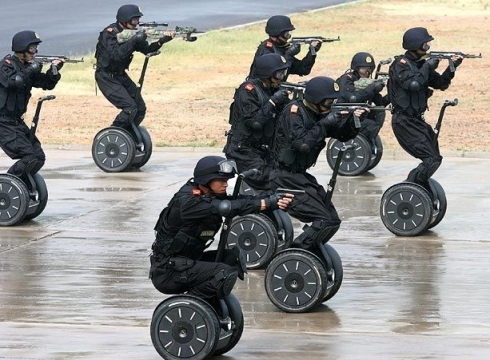 But an army of these for riot control? In World War I they stuck a machine gun port out the center window. Why am I reminded of the chariot race scene in “Ben-Hur”? August, and Remembering the Atomic Age – A Balance of Guilt, Fear, and… North Korea? Maybe they are kitting up for the ‘big one’, Doug? That day when the survivalists and the good old boys show us what they really have stashed in the bunkers, or backwoods cabins. Or perhaps the sort of guys joining such units need these military things to feed their fetish? FYI… this damn Jetpack for WordPress does not work well with my WordPress theme… and eac time I make a post to reply on my own blog I have to also fill in all the crap at the bottom.. and then I have to approve myself! Godamn tech people. It works if I play by the rules. Tick the boxes for replies, etc. Still take a lot of time spinning around deciding to add the comments though. Well.. good point. If they are not close to the communities to understand why black Americans don’t wanna be shot at traffic stops then likely they they have no idea what they need to shoot them with. Good series….have you seen this article? When I first heard about this, I had a similar reaction, but then I decided the news media was making a mountain out of a mole hill. Once state and local officials got a whiff of the public reaction, they would stop their guys from accepting stuff they could not justify. Even if the equipment is free, it costs money to retrofit and operate. We have a Federal system. The central government government has some surplus military equipment. What does it do with it? If national guard units don’t want it, what about the police departments? It is really up to state governments to figure out just what sort of equipment their state and local polices forces should have available. Just because the Federal Government makes something available does not mean they have to accept it. What probably makes the most sense? 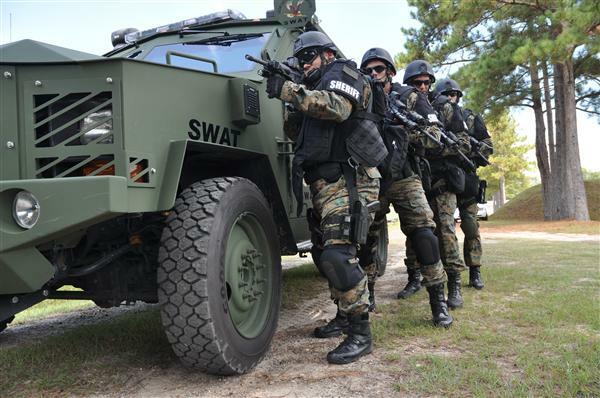 To deal with those situations where the criminal element is especially well armed, each state and large city should maintain well armed SWAT teams, which is effectively what already happens. If terrorists are involved or anticipated, armored vehicles may be called for, but treads are hard on road surfaces. So I doubt you will find many police departments who want them. Can you imagine what a 60 ton tank would do to an asphalt or concrete road? The voters would have a cow. The bottom line is that we elect people to figure out how much force to deploy when force is needed. That includes the people who run our state and local governments. If the Federal Government government is willing to trust those people to figure out what they need, I don’t see a problem. Those people are us. Will we sometimes make mistakes? Yes. However, I think our main concern should be making certain that when the the Federal Government gives something away it is giving it to legitimate law enforcement agencies. You cite some well defined points, Tom. The key is like what I mentioned and you echoed here and that is making sure our voices are heard in the city councils of the country to make sure these giveaways are cleared by our representatives in local government. As you said.. a treaded vehicle will tear up streets even if the tread pads are rubber.. the weight of the tank itself. Then add to that the training and certification expense to operate such vehicles.. and.. the fuel for all this training and actual deployment, and these things do require preventive maintenance and repairs… and likely Joe’s Auto and Truck Repair over on Main and Washington is not going to know how to fix it. For the life of me.. it seems so obvious and far cheaper to purchase and refurb some old Brinks armored truck. Probably. Some military equipment is fairly ordinary, but some is made to rather unusual specifications. The oddest I can think of offhand is that cannon on the A10. Fired bullets made of uranium. Went right through tanks.